Aside from 1950's & 1960's vintage stuff, I've also been swept up by the flood of friends who are getting into Steampunk. I have long had a fascination with Victorian era fashion, which I think was strongest when I was a goth many years ago. There is an upcoming steampunk party that we've been invited to and while I've been both drooling and boggling at some of the steampunk costumes out there, I have failed to actually come up with what I'm going to wear. My thoughts so far have been along the aviator line, possibly a bit Sky Captain-ish. Though I think this is really cute. I'm hoping that these will give me a good starting point to get the Victorian shape right. I'm hoping I can modify the riding habit to have a bit of an aviator feel, but with the Victorian silhouette. It is actually quite good. I think my fundamental lack of dexterity and ability to hold my arms up for any length of time may prove to be my downfall, but it is a really nifty book. 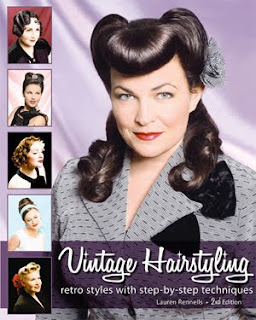 I finally understand how finger waves and pin curls are done. I'm curious about how well my hair would hold a wet set (which is touted as the strongest set), since my hair is incredibly fine and has trouble even holding a perm (it was a the early 90's and yes it looked ridiculous). Still, I have more of a clue about styling my hair than I did before. Tonight I'm off to Melbourne, then Tassie, then back to Melbourne. Shopping will include the Melbourne Theatre Company garage sale, various vintage haunts and markets. Not to mention seeing fabulous friends who will no doubt inspire me so that when I come home I'm eager to get stuck in and make stuff. Reconstructing History had it for cheaper than Amazon (not sure if it was a special sale price).